The Accountability and Performance Improvement Framework aims to support improvement in education outcomes for Northern Territory students. It provides a system of accountability for the whole department, including schools, and monitors actions to improve the quality of services provided. streamlined processes to focus on priority areas that will make a difference. 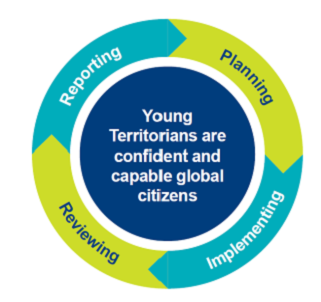 Young people are at the centre of the framework - planning, implementing, monitoring and reviewing the Department of Education's vision of 'Young Territorians are confident and capable global citizens'. Planning is the foundation of our performance improvement cycle. To achieve improved outcomes for students there needs to be clear direction and effective planning at all levels of the department. The Department of Education's strategic plan sets out the goals and strategies to achieve the vision to educate young Territorians to become confident and capable global citizens. The goals and strategies are translated into actions through directorate plans, into division and regional plans, into business and school plans, and then into individual staff plans. Embedding plans into action in our daily operations ensures we are focused on improving our performance. Processes that provide the opportunity for continuous feedback and improvement are important to creating a high-performing system. Regularly monitoring and reviewing performance assists with determining the effectiveness of strategies and actions, the rate of improvement, and guides decisions and future actions. Internal quarterly reports monitor the department's progress towards implementing the strategic plan. This includes reporting performance against the strategic goals, key actions and a set of performance measures. The department assesses risks to achievement and applies risk mitigation strategies. Performance is reviewed annually and determines future key actions and targets based on progress against performance measures and targets. The department analyses its performance and uses evidence-based practice to inform planning of future actions and investment. The department is transparent and accountable to the community. A public progress report is released every six months. Read about progress reports and the department's strategic plan. A comprehensive report each year is provided through the department’s annual report, including reporting on performance and the department's financial position. The department uses findings of monitoring and reviewing to ensure performance is improved. Progress and systems are continually monitored to ensure they are as effective and efficient as possible and are contributing to coordinated effort and a culture of improvement across the department. You can obtain further information by calling (08) 8999 5636 or emailing spigr1.decs@nt.gov.au.